A century of incorporated growth is the proud heritage of Woodbury, New Jersey. A city that on January 2, 1971 declared a year-long series of events to commemorate this important date. Mayor Robert E. Brumund led his community to the start of their second. 100 years by announcing that Woodbury would have a Centennial Ball, Youth Activities, Parades, Tournaments, an Historical Booklet –even a beard growing contest! Mr. Herbert A. Budd, Jr., the president of the Woodbury Rotary Club, noted that his organization was in its 50th year of service to the community. He ordered a fitting commemorative of the two historical celebrations – a hand-made, mouth-blown, glass bottle designed and created in the manner of the famed New Jersey glass makers. The official seal of the City of Woodbury is embossed on one side of the deep blue, 7" high bottle; on the reverse side the Rotary International seal has been molded into the flask, making an attractive and authentic memento of these historic events. Mr. Budd, of 423 So. Girard St., in Woodbury, chose the Clevenger Bros. Glass Works of Clayton, New Jersey, to design and blow the bottles. Produced in very limited quantities, they have become a treasured collector's item. It is to Mr. - Budd's credit that he visualized a further glass application of the historic Woodbury bottle. From the same mouth-blown molds a few commemorative plates were fashioned. The Woodbury New Jersey plate is taken from the same mouth-blown molds that produced the now rare Woodbury commemorative bottle. Fashioned in the historic Star & Dewdrop pattern, the 7" plates were created in deep blue glass and became an immediate rarity. 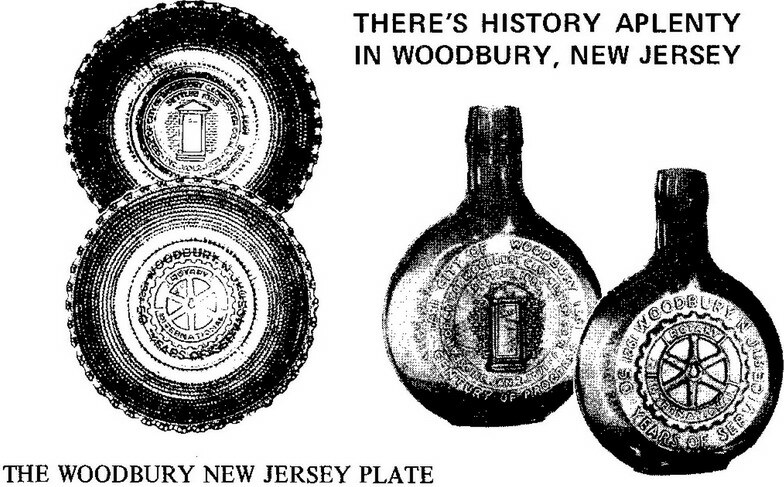 With both the bottles and plates, the City of Woodbury and the Woodbury Rotary Club had historic-memento successes. And Woodbury is an historic city. Founded by a Quaker family, Woodbury is a combination of the family name Woods and the Woods' local parish in England, Bury. Settled in Deptford Township about 1685, the City of Woodbury was not incorporated until January 2, 1871. So it is that in 1971 the 100th Anniversary of the City and the 50th Anniversary of the Woodbury Rotary Club are celebrated. Both the commemorative bottles and the commemorative plates were fashioned by the Clevenger Bros. Glass Works of Clayton, New Jersey – and were produced in the same historic, hand crafted manner that has made Jersey glass synonymous with America's founding. The original molds for these valuable mementos were chromium plated and presented to the Gloucester County Historical Society Museum along with the first bottle and plates that were made. A great deal of credit goes to our President's Rotary Ann Phyllis Budd who originated the idea. Woodbury Rotary takes this opportunity to express its appreciation for the great deal of time and effort Phyllis contributed in helping to make our 50th Anniversary a huge success.